Pacific Ocean Front, Private, Romantic, Whale Watch from Deck! This is our second home and is not your typical stripped rental home. The house has wonderful art and nautical antiques. The full Pacific Ocean view is amazing. This is a terrific honeymoon or special anniversary home. It is common to see sea lions and whales in front. The sunsets and stars at night are spectacular. The 3 guest rooms consist of 1 queen Master and 1 queen guest room and 1 double (Lazy Boy) hide-a bed. There is also another inflatable double mattress available for kids. The restored pool table is over 120 years old. Directly in front of the home is tide pooling and shoreline excursions. A short walk to Black Sands Beach and the trailhead for the 'Lost Coast' wilderness area. A 30 minute drive to the world famous 'Avenue of the Giants' redwood forest. Heidi and I absolutely love the ocean. We are both self employed and require frequent getaways to completely relax. We are fortuneate enough to able to 'fly in' to Shelter Cove in our Beechcraft Bonanza. We love to share this amazing place with our VRBO friends. Shelter Cove is one of the last places where you can own a home right on the Pacific Ocean. It is very quant and the people are very friendly. It has a great public airstrip. The natural wildlife and fishing is amazing, not to mention the whales breaching in front of the house! Ocean kayaking, fishing, abalone diving, and relaxing! Oh the sunsets are unbelievable. Golf Clubs, ipod with docking, spices, firewood, Charter Fishing available, kayaks available to rent, Abalone diving. The house is beautiful and nicely appointed. Right on the ocean, with a beautiful view. Off the beaten path, this is a great area to escape to ! One of kind ocean front property! The home was clean and well appointed. We loved the comfortable furniture, the whale sculpture, and the other art on the walls and shelves. We enjoyed time on the deck in the sun, and even more time in the window seat/nook that overlooks the slot canyon below the deck. Loved the flowering jade tree near the front door! We took the recommendation to shop for food and drink before taking the road to Shelter Cove (this was a good plan since the few local restaurants were closed or very quiet over the few days around Christmas). We hope to return one day, sooner than later! Was a truly wonderful home. It'll take your breath away. Was so relaxing. You'll be in heaven. This ocean front home is totally awesome. It is completely setup for any type of stay. Everything we needed was available at the house. This lovely home is very well laid out. Fantastic ocean views from numerous windows on the ground floor and 2nd level. The inside furniture is truly beautiful. The wifes fell in love with it. Perfectly decorated in all aspects. Has many extra features that we really enjoyed during our stay. Was a pleasure being able to play the pool table. Has a large deck facing the ocean. The veiws are unbelievable. We had the pleasure of seeing a couple orcas and numerous dolphins plus numerous seals from the deck and inside of the house. You'll find out you won't want to leave. Time flies and you'll be both sad and overjoyed with your time spent in this one of a kind setting, only because before you know it your on your way home. This was my wife and I second stay at this ocean front home. My brother inlaw and sister inlaw joined us this time. They were truly amazed at the setting and everything this home had to offer. Nice restaurants are available to utilize. The black sand beach is something that you'll charish forever. There is surf fishing. A little info. Take a 5 gallon bucket with you. You'll need it for the fish you'll be pulling in. There's a really nice fish cleaning station by the boat launching area. The weather was nice. The 4 of us are already planning our next trip to this fantastic place. We've all decided this will become a yearly tradition for us. Were really excited about our future return trips. Would like to thank Chris and his wife for providing such a truly wonderful home. Great! The view is Amazing from all angles of this house. It has the amenities needed for a great vacation. Yes, the road into Shelter Cove is rough but it is worth it! 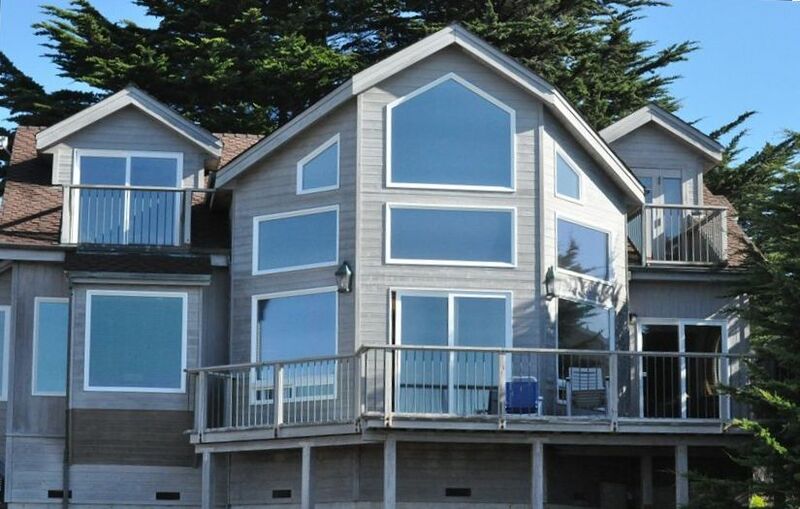 The house was comfortable and we enjoyed watching the ocean from the deck and the many windows. We had great sunset views and could just walk out the door to explore tide pools and see seals. The kitchen had pretty much everything we needed and my teens loved the pool table. Shelter Cove is a nice, quiet community. I highly recommend it! Lovely, well appointed home with GREAT view. Very relaxing environment. 6 Guests Maximum, any additional guests are $50 per night and require owners approval.